The holiday season is rapidly approaching (for some it has already past), and as we seek out the perfect gift for that special someone, I offer up the gift of culinary knowledge. Whether your recipe repertoire needs a little spicing up or you are just looking for some tips and tricks from a pro, these cooking events are both fun and educational. Plus, in Fairfield County we are lucky to have access to a variety of chefs with serious pedigree. Avoid the malls. These outstanding Fairfield County cooking classes are all you need: Sono Baking Co.'s John Barricelli, Match's Matt Storch, Chocopologie's Fritz Knipschildt, Barcelona or Brazilian, there is something for every cook--including some great holiday classes for kids. Your friends and family will thank you (and this year they'll mean it). BARCELONA offers a variety of cooking classes, most of which are taught by one of Barcelona's talented executive chefs. In their popular "Cook The Book" series ($30 per person), guests are led through a series of recipes from The Barcelona Cookbook. Menus and teachers will vary based on location. Barcelona locations also offers seasonally themed cooking classes such as West Hartford's Finger Foods class on January 17th. Private cooking classes can be scheduled by calling any of the Barcelona locations. Refer to their web site for more information. CHEF LETICIA is the author of The Brazilian Kitchen: 100 Classic and Contemporary Recipes for the Home Cook. She teaches classes and makes radio and TV appearances around the tri-state area, but if you have a group of 6 or more, you can set up an intimate cooking class in her beautiful home. Chef Leticia's vibrant Brazilian cuisine matches her personality. She welcomes menu suggestions, and her warmth and energy make these classes truly exception evenings. Prices range from $80-$100 per person. Check out our CTbites review. SUGAR & OLIVES: Jennifer Balin's locally sourced organic kitchen is housed in one of the best dining lounges in Fairfield County. Guests are invited into her open prep space for demonstrations and hands on cooking experiences. Classes are offered weekly with themes like Saute 101, Hors D'oeuvres In A Pinch, and Cocktail Mixology. Jennifer is astute at demonstrating the basics, and she makes some seriously exceptional and creative cocktails. Sugar & Olives also has a full season of kids classes. 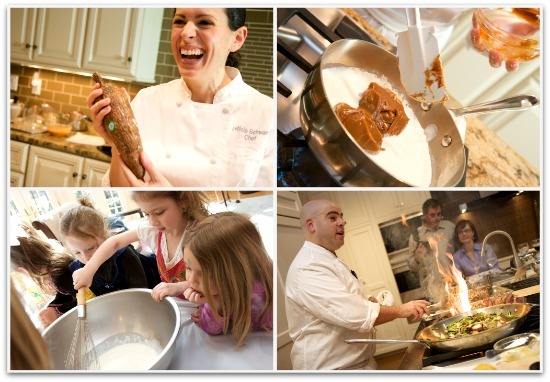 AUX DELICES COOKING SCHOOL offers classes in their professional kitchen in Stamford for both adults and children. Adults’ classes are on Wednesday eves and kids’ classes are on Sunday afternoons. They will also customize classes for special occasions including birthday parties, wedding showers or company outings. Classes generally range from $90-$125, depending on if they are demonstration or hands-on. Some exciting choice being offered for adults in early 2011 include “FIVE NIGHTS, FIVE MEALS” when Chef Lynn Manheim will teach the basics of roasting succulent chicken with wild rice and sauteed swiss chard. Each subsequent recipe builds upon using leftovers of the previous night while adding new dishes. Go to www.auxdelicesfoods.com for a full schedule of classes or to buy a gift certificate. CAKESUITE: Chef/Owner Michele Klem offers classes in her bakery/storefront, CAKESUITE in Westport, for both children and adults. If a holiday is approaching, Michele is sure to be offering a hands-on class to help home bakers become adept at creating seasonal treats. This season’s classes included “Cake Decorating with Fondant,” “Christmas Cookies” and “Chanukah Cookies” for kids and adults at separate times, and “Building Gingerbread Houses.” In addition, Michele offers one on one baking or decorating sessions for $75. an hour. Two hours are recommended in order to learn enough to manage your newly acquired skill on your own. Call Michele to register or buy a gift certificate. Winter classes for 2011 will be posted soon. Buy certificates now. Go to www.cakesuite.com/class or call: 203-856-8010 or 203-557-0247. BERNARD’S in Ridgefield offers classes once a month in their dining room where 25-30 guests will watch a demonstration and ask questions of Chef Bernard Bouissou as he teaches participants the true French way of preparing a seasonal three course meal. The demonstration is in the dining room, where the entire meal will be presented to participants for their enjoyment at the conclusion. Gift certificates may be purchased on line or over the phone. The $75.00 fee includes the lesson and the meal. CLARKE CULINARY CENTER's Chef Series gives CT residents access to some of the finest chefs in Fairfield County. Featuring talented chefs like Matthew Storch (Match), Fritz Knipschildt (Chocopologie), and Pietro Scotti of DaPietro's. The Clarke Culinary Center's beautiful kitchen showroom proves an intimate setting for a a season of interesting seasonal classes. Classes are $85 and include a wonderful meal from the fruits of your labor. CHEF NICOLE STRAIGHT is one of CTbites regularly contributing chefs as well as a champion for quick healthy meals for your family. Chef Nicole gives busy people the tools to prepare terrific tasty meals, often in under an half hour. Chef Nicole is happy to tailor a menu to fit your needs and will cook for any group under 12 guests. Her tips on preparation, cooking shortcuts and equipment are ones you will repeat to yourself again and again. EMILIE-YOUR FRENCH CHEF provides an immersive French cooking experience. Emilie teaches guests how to plan and prepare a meal from scratch while sharing valuable tips and tricks for holiday or any day meal prep. But Emilie does not only provide cooking wisdom, she will also teach you some French if you want to brush up your language skills. Classes are held at her kitchen in Trumbull, CT or you can set up a private event in the comfort of your own home. Classes range from about $60-$75 a person. Her macaroons are renown in Fairfield County. CINDY'S SOUS CHEFS: Need a great gift for a younger chef? Cindy Hartog is a teacher, actress and chef and owner of Cindy's Sous Chefs. Cindy elevates cooking with kids ages 3-teen by creating an engaging and immersive experience complete with role playing, costumes, and foreign languages. Whether you are throwing a pizza party a mock Food Network Show, or a chocolate buffet, kids will ask for more when the session is done. Her daughter Danielle helps out in the kitchen with equal finesse. Related Links: Also refer to our article on Cooking Camps for Kids for more great ideas for the younger set.